Political events of the last two decades - the fall of the Soviet Union, the end of history, the terrorist attacks on America and the economic crisis - seemingly put an end to utopia understood as social dreaming. In the world of the post such an attitude seems either anachronistic (as the dreams are believed to have come true), or naive (as the results of the dreams have been deemed disastrous). The beginning of the 21 st century, then, seems little favourable to utopics, be it in political reflection, communal practice, or the arts. And yet, as always, the times of crisis are simultaneously the times of opportunity -a chance to reconsider and redefine the concepts and notions traditionally used in utopian studies. The present volume offers a collection of essays whose task is precisely to try and capture what it means to think utopia at the times when utopianism seems to be either compromised or useless. 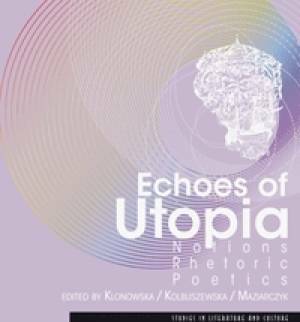 It tries to locate and record the echoes of utopia os reverberating in philosophical and social science, in the arts, and in the practice of everyday life. The echoes that are necessarily transformed and reshaped, and yet - it is our contention - still strong and vibrani, thus giving hope, not just for the survival of utopia, but also for its rejuvenation and vigour.